Full service pro shop with decent selection of gear and good deals on occasion. 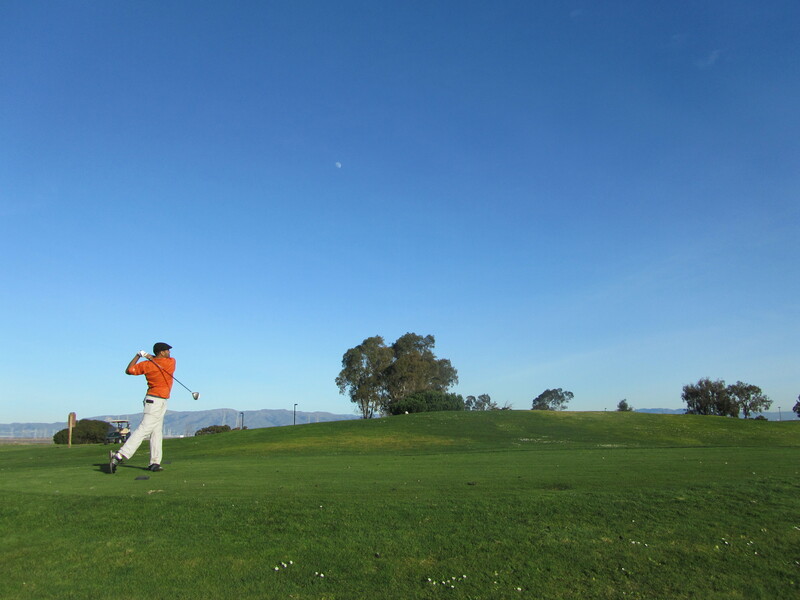 1) JK and I played this course together when we were both working in Palo Alto. We were both incredibly impressed by the volume of goose poop that littered this course. We both recommended to the pro shop that the course retain a pack of dogs to help reduce the problem. Seriously, this amount of poop could be used to fertilize any number of “green” projects around the state. 2) We played the course in the mid-afternoon. By the time we reached the back nine, the wind had kicked up so violently that we really had no chance to make any kind of score. The notorious Bay wind really bears its teeth in the afternoons on this course. 3) The par 3s are not really that great. As I play more golf, I realize that I tend to judge a course more by the quality of the par 3s than any other holes on the course. These holes tend to be the most scenic and provide the best drama in most rounds of golf. While I love the set of par 5s that this course offers, the par 3s probably equal out the rating. Three of the four are long forced carries. While I have no issue with this kind of hole, I find these three to be rather repetitive. The par 3 eighth hole, however, has a very interesting green and a tricky bunker that make it an enjoyable hole. After our initial negative experience, I was hesitant to revisit Shoreline. After moving to Mountain View, however, I had little choice. Time to play golf has become increasingly limited so even a windy round is highly welcomed. After a few weekend rounds here though, I must admit that first impressions can be deceiving Shoreline is as interesting a layout as almost any muni I’ve had a chance to play. When compared to the Palo Alto Muni, it’s certainly the more interesting track. The course opens with a 579 yard par 5 that plays uphill (I almost got there in two!) and does not get much shorter. The back nine has some of the more interesting holes, to be sure, but the par-5 ninth and tenth (back to back par 5s!) offer two major scoring opportunities. The 9th is a paltry 519 yards and its mate is 525. An ace on either par three that bookend this pair puts you in prime position to do what Phil came up just short of at last year’s Masters – three eagles in a row. 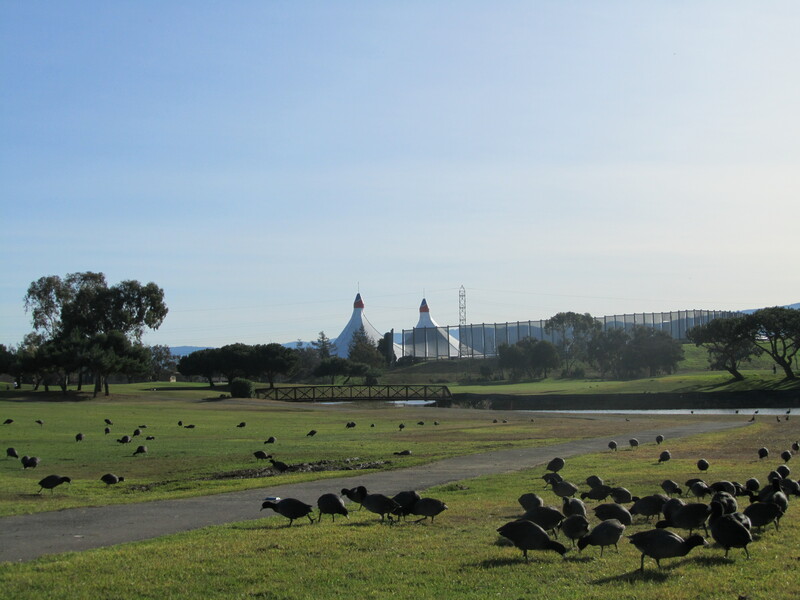 Overall, if you are in the area and have time to get round of golf in, I’d highly recommend Shoreline over the other munis in the immediate area. 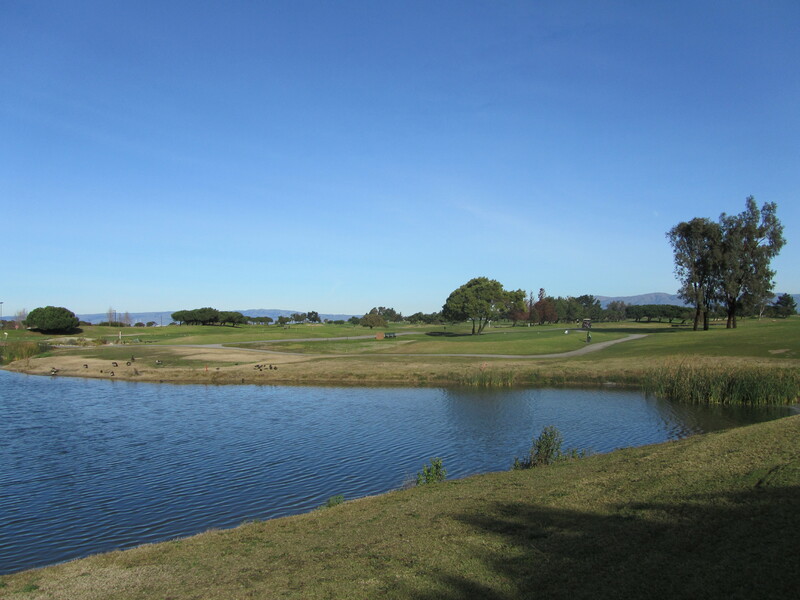 Not to knock the Palo Alto muni, but I’d rather pay less to play a more interesting layout with some goose poop on it than a long, boring track where you can see nearly every single flag from any place on the course. 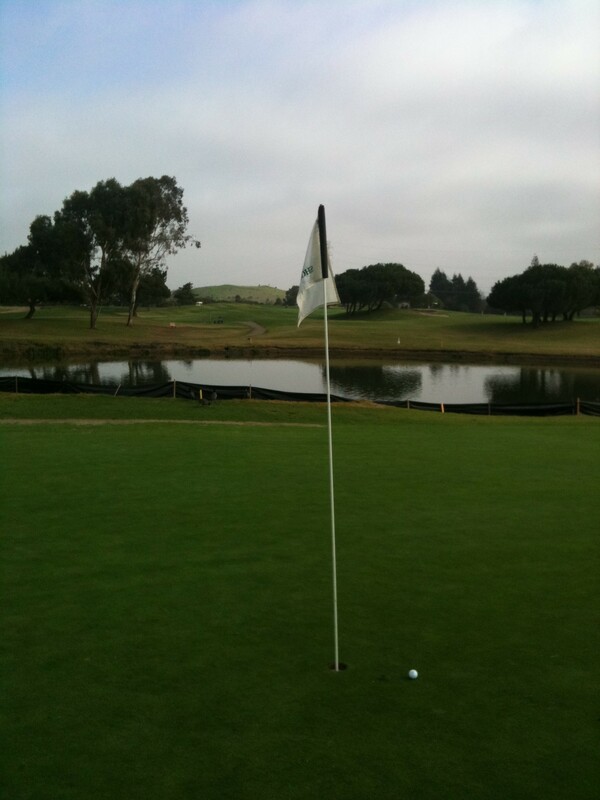 It also probably doesn’t help my bias that I nearly aced the par 3 fourth hole (see below and POTW 6). 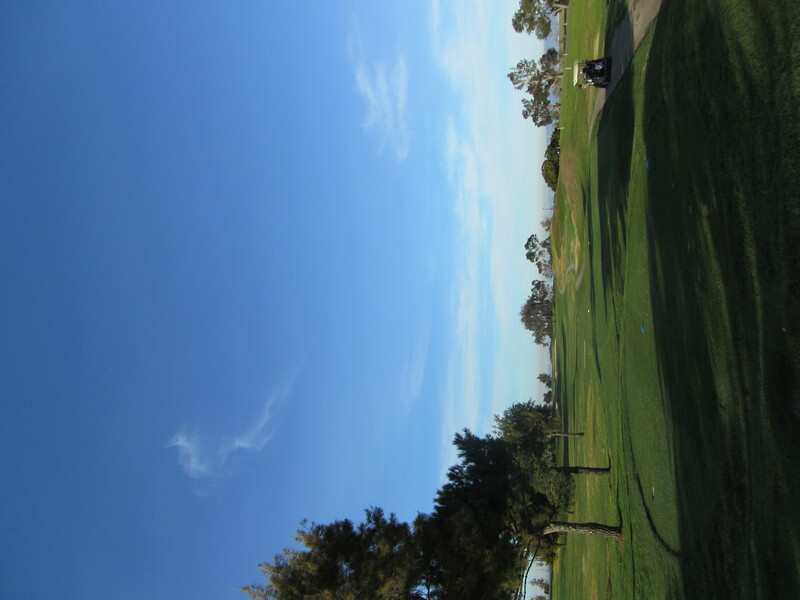 The Verdict: Great casual round, but if you’re looking for high end golf, look elsewhere. A good, fair review. I would say that the wind really put a damper on my enjoyment of the course–particularly the corridor over near the bay. I did like the layout, and, if it were a less windy day, I’m sure I would’ve been more impressed. Like most Cali muni’s, though, it is about as flat as Nebraska, and has few trees. Altogether, not too bad–I would certainly go back.